Tonight the new fire is lighted. We wander in the dark, listening to the salvation story. The wait is over, the tomb is empty, and we have dazzling light. Open your eyes, look around and witness the return of love. Not just love’s return, but love’s triumph over death. All it took was three very long days, the longest days of your life, really. Have you ever sat at a funeral, looking at the casket, wondering how you would get to the next day? How did you end up sitting on that pew and someone else ended up lying in a casket? Now what? You hold your breath, but you do not know that you are holding it. What if he or she came back? At first, I imagine all sorts of zombie foolishness. I am holed up in my basement, the doors barricaded, and dad’s corpse on the outside, banging on the house, and shouting: “Brains! Brains!” Of course, that would never happen because we do not have basements in New Orleans. The image is ridiculous, but as a precaution, I make it a personal policy not to support any university that studies Corpse Re-animation, 101 or the follow-up course Aiming for the Brain, 102. But seriously, how strange would it be to have that dear one return healthy and alive? What a reversal? Finally you could breathe again. I think we would be terrified and exhilarated because of what that resurrection shows us. That resurrection shows us that this end is not an ending at all. All those things that frightened us are just smoke and darkness. The darkness cannot overcome the light. Not even death can diminish the power of love. We do not have to be frightened to love and lose because love will continue. We can go to the very length of love and find out that it continues beyond the horizon into forever, a world without end. Hats off to you. I don't know of anyone else who could work zombies into an Easter meditation and make it hilarious and beautiful all at the same time! 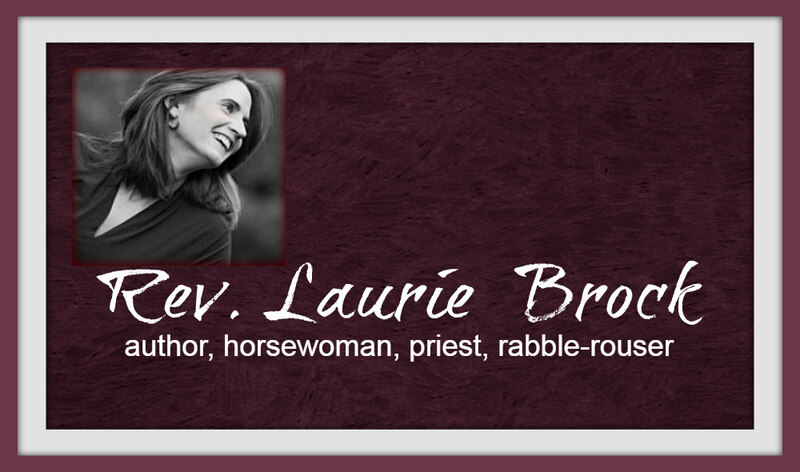 Laurie and Mary, I've just discovered your blog and after having read some of your posts aloud to the hubby, you're so on the favorites-list. Thanks! And - are you Young Clergy Women Project members? If not, I think you would have a blast with us! Come join! Peace and blessings from a Lutheran sister in ministry! Amen! So glad to have found you. Wish you were in my diocese (VA). Stopping by on Mimi's recommendation to say "Hi!". Good luck. Plan to be back soon. I'm glad to have just found you too...and if you aren't members of the Religious Institute's network, I hope you will endorse our Religious Declaration (www.religiousinstitute.org/endorse) and find out more about our ministry on sexuality and religion. I also blog at http://debrahaffner.blogspot.com Blessings for the season! Grandmere Mimi sent me too! --many blessings and happy Easter! I was thinking of Blessed Phil Hartman's caveman, "FIRE BAD!" bit from SNL. Grandmère Mimi is getting you lots of new readers... love your subtitle... my first Sunday qua transitional deacon that bra strap slipped down to where I could not tastefully hoist it back up and it has been 'T' straps ever since. TMI perhaps but since you've got it in your title...! great post! let's hear it for gals like you who are theologically thoughtful & fashionable at the same time! You guys are fun! Nice to see some fab priests sharing thoughtful reflections with boldness. I raise my glass from one clergy gal to another (Presby minister in Philadelphia)... God's grace and peace be with you! I have really enjoyed reading the Easter thoughts of the cyber faithful. Thanks. Hi Laurie and Mary. I know some of the folks who left comments here. Just because they say I sent them here doesn't mean I vouch for them, or anything. In fact, a couple of them are a bit iffy, if you know what I mean. We can go to the very length of love and find out that it continues beyond the horizon into forever, a world without end.